Hello, folks! This is Step #7 in my "How to Shoot a Bow and Arrow" sequence. Here, we'll learn about one of the most important concepts in all of archery: the anchor point. When you draw the bow and pull the bow string back, you'll notice that it comes close to your face. That can be kind of scary, but it's actually a good thing, and proper form. The anchor point is a spot on your face that your bow string hand---or the string itself---should touch when you're at full draw. The anchor point is crucially important, because having a single spot to which you routinely draw means that you will be able to aim with consistency. Without an anchor point, it is absolutely impossible to consistently hit a target. Let's take a look at how the type of bow you're using determines your anchor spot, and examine a couple of photos of archers and their anchor spots. If you're watching any archery competition, you may see archers use an under-the-jaw anchor (and if you watch the Olympics, you'll see a lot of under-the-jaw anchors). 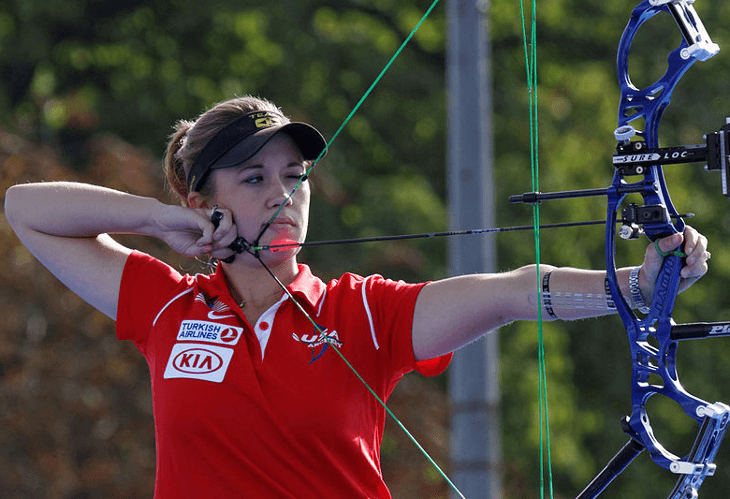 The under-the-jaw anchor gives competitive archers more points of reference: they can feel their hand underneath their chin, the string at the same spot on their lips, and the string on their nose. After extensive practice, they build up a sense memory of where the string should be at each point, and are able to draw the bow exactly to the same spot time and time again---which translates to more accuracy and consistency. Below, South Korean Olympic gold medalist Ki Bo-bae uses an under-the-jaw anchor that comes to the tip of her nose, the middle of her lips, and just under her jaw. Compound bow users will sometimes put a "kisser button" onto their bowstring to help them out. A kisser button is a little item that looks a bit like a bead, and when the archer is at full draw, the kisser button will connect to the side of the mouth, as another way to secure an anchor point. (By the way, there are some coaches who say that if you're using a kisser button, you shouldn't also be using a peep sight; you should give that post a read if you've got both). It's occurred to me that I should have named this site "The Devil is in the Details" instead of "Complete Guide to Archery," because man, once you start to explain your understanding of archery, you realize that there are a LOT of details in archery! If you're a little weirded out by having the bow string so close to your face, that's OK. It is a little weird, and for a lot of people, it feels uncomfortable at first, or even a little threatening. With time, that feeling will pass. Keep your head in the same position every time you draw. Your neck should be relaxed and your head should be in the same place every time your draw. If, on different draws, you move your head a half-inch forward or a half-inch back, that means your anchor point has changed, and your shots won't be accurate. Draw your string to the anchor point; don't bring your anchor point to your full draw. Sometimes when people draw, they bring their anchor point to the bow string---that's wrong. You should feel the bow string connect to your anchor point at full draw; you shouldn't have to search for that contact. If that's the case, and you're finding that you are moving your head to connect your anchor point to the bow string, bring your bow to a staffer at the range or a pro shop and have them look at what's going on. Keep your teeth together and don't chew gum. Remember, anything that changes the location of your anchor point---even by just a few millimeters---will affect the consistency of your shots. There's no "right" anchor spot. Different archers and archers engaging in different styles of archery will utilize different anchors spots, and, as you practice and gain experience and knowledge, you may even decide to move your anchor point. Archery is a sport that rewards exact repetition; when you can create a shooting sequence that works for you, and you practice and practice and practice until that sequence becomes second-nature, you'll see a dramatic uptick in your accuracy. Over time, your anchor point becomes more of a sense memory, and after a few hundred ends of pulling the draw string to the same spot, it'll actually feel *strange* if you draw the bow and don't meet your anchor spot. Welcome to The Complete Guide to Archery (www.CompleteGuideToArchery.com). We are a participant in the Amazon Services LLC Associates Program, an affiliate advertising program designed to provide a means for us to earn fees by linking to Amazon.com and affiliated sites. Amazon and the Amazon logo are trademarks of Amazon.com, Inc. or its affiliates.